Quality should be the primary driving factor because no matter how great the deal, you barely have time to do it once, let alone time (or money) to do it over. So what do we mean when we say “quality?” While “style” may influence the overall appearance and presentation of the final gallery, a level of technical expertise should be demonstrated by the photographer. Images should be properly exposed. The highlights and shadows of the images should not be void of any color, to bright or too dark, saturation should not be so intense that that colors will be comprised when they are printed. Subjects should be in focus and images should never be be pixelated or posterized when printed. Composition should be intentional and the photographer should be able to capture subjects with flattering light and angles. Images shouldn’t be “saved” by Photoshop actions and should look as good printed at 24×30 as they do online. Typically being able to CONSISTENTLY perform to a level of quality requires significant experience rather than just a hobbyist who can pull out 5-10 great shots out of 100 snapped. One of the best ways a photographer can demonstrate quality and experience is to have a portfolio and a broad representation of full client galleries to show. Almost as important as quality and expertise is to find a photographer who has a style that resonates with you, and your life. Take some time to think about the style of images you are looking for. Do you want studio (either classic and simple or with props for some shots) or do you want on-location or natural light, and if so, where? Where will you display your images and what are you looking to accomplish with them (i.e. wall displays in a casual or formal room, to compliment a display that has been built over time, a heirloom album showcasing your entire shoot)? It’s extremely important that you choose a photographer whose galleries and portfolio reflect what you are looking for, and reflect it consistently without a constant changing style. Check out their work on their blog and website. You should be able to get a feel for whether they maintain a style and have mastered it, or whether they jump from trend to trend. Regardless, make sure you really assess what you want your outcome to be, as it relates to your life, and your personal style, and try not to be swayed by “what’s hot” as whatever is hot might not really make sense in the big picture. Once you have selected a few photographers that you believe meet your quality, expertise, style and vision goals, make sure you have a conversation with them to discuss planning your session, and your goals. You will want them to understand what you are looking for so they can agree it’s something they can accomplish. Price should be the LAST thing you consider when you select your photographer. Really? What if I come up with a list of photographers I can’t afford? First you have to define “afford.” No doubt custom photography is an investment, and also a luxury expenditure. And everyone has different levels of either saved or disposable income that can be allocated to a session. When defining your budget, determine whether you will save, and then have that set amount to spend or whether you can make that decision once you see your images. Then decide what your product goals are: digital files, a few select prints, a gift album. Understanding what you really need as well as what you want, will help you determine what you can spend with a particular photographer. You may have a budget that will allow you to purchase ALL images from one photographer of mediocre quality or SOME images, but exactly what you need, from an exceptional one. As we’ve said before, try to not get locked into the idea of “all” before you know what “all” looks like. 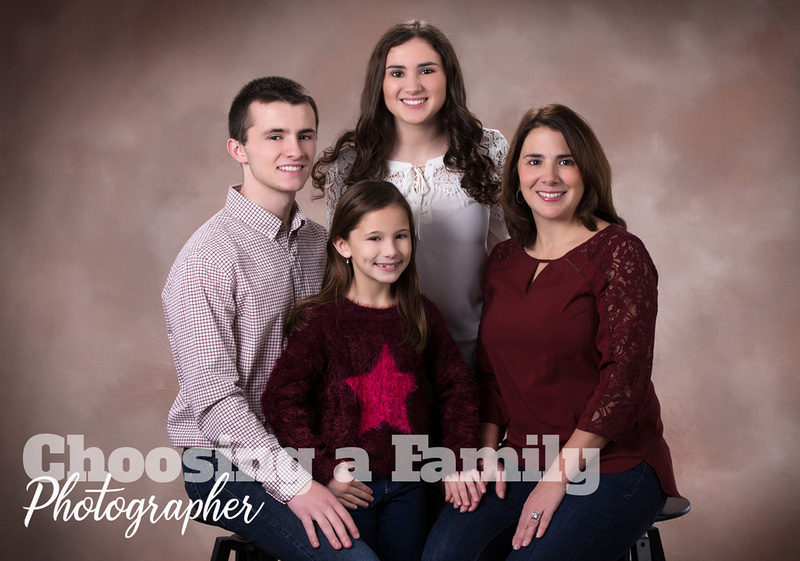 You may even be able to work with specific photographers to find out when they schedule less expensive options such as studio or seasonal mini-session events as many photographers offer a scalable way for you to receive their services without the truly significant investment. It’s with hesitation and a sigh that we say that with most budget photographers, “you get with you pay for.” In a few rare, and very fortunate circumstances, you receive outstanding images for a fraction of what they are worth. But more often than not, if you aren’t investing in someone who has invested in the quality, expertise, style and vision, you will receive images that reflect just that. That said, there are tremendously talented photographers in every market segment, catering to any budget, and with research and patience and maybe a referral, you can find one that meets your specific needs. Circling back to the point that you barely have time to do it once, once you’ve finished the end to end coordination of schedules, wardrobes, weather and moods… you most certainly don’t have the time, or money, to do it over. Start with planning your own session goals, including what you would like to DO with your images, then consider the style and vision you would like them to reflect. Spend some time looking at portfolios and gathering recommendations, and assess as best you can, the quality and expertise of a range of photographers, and once you’ve created a short list, begin to think about pricing and budget and the best way to marry what you need with what you can afford. And if you have a gut feeling that you are cutting corners in any of those orders, take a step back. It’s okay to put an idea on hold until you are really sure about it. It’s your investment, make the most of it.